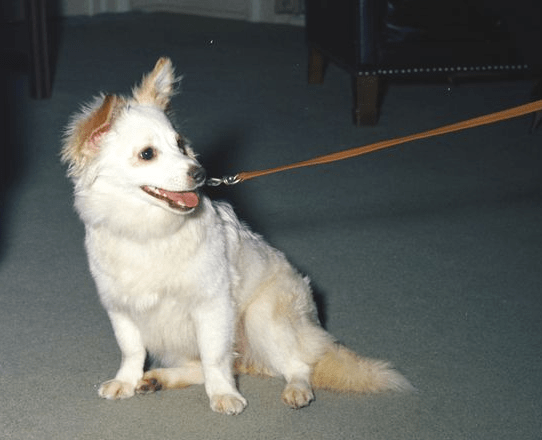 A bright spot during the cold war between the United States and the Soviet Union was Soviet leader Nikita Khrushchev’s gift of a fluffy white mixed-breed puppy to little Caroline Kennedy. Pushinka, Russian for “Fluffy,” was a puppy of Strelka, a Soviet space dog that orbited the planet aboard Sputnik 2 in 1960. The puppy Pushinka was welcomed into the family of White House pets during the John F. Kennedy administration. In fact, Pushinka and Caroline Kennedy’s Welsh terrier Charlie had four puppies together. You can read about their puppies here. In a television interview with Larry King in 1995, the late John F. Kennedy Jr. recalled that he and his sister, Caroline, taught Pushinka how to go down the slide on the playground behind the White House. “Sending the dog down that slide is probably my first memory,” he shared. Apparently Pushinka had a somewhat prickly nature. In his book American Legacy: The Story of John and Caroline Kennedy, author David Heymann relates a story from White House nanny Maud Shaw: Caroline and her nanny encountered Pushinka as she was being walked by a kennel worker on the White House grounds. As Caroline reached to pet the dog, Pushinka growled. “Instead of recoiling, Caroline stepped behind the dog and gave it a swift kick to the rear end,” Heymann writes. “Emitting a howl, Pushinka turned tail and raced off into the night. I have the original copy of the second and third pictures in this article and I would like to know who you got it from. Also that is my great grandfather in the second picture holding the puppies. That is so cool that your great-grandfather is in the middle photo! We’ve added the credit for those two photos. Long story short, they are in the public domain by way of the White House.